Rio Grande senior Aleah Pelphrey became the 14th member of the school’s 1,000-kill club during the second set of Tuesday night’s 3-0 loss at West Virginia University-Tech at Van Meter Gymnasium in Beckley, W.Va. 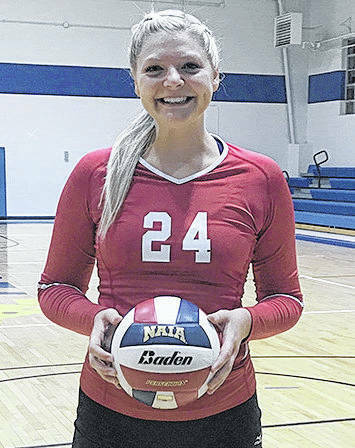 The Piketon, Ohio native finished with a match-high 14 kills in a losing cause. BECKLEY, W.Va. — West Virginia University-Tech used a big run in each set to post a 3-0 win over the University of Rio Grande, Tuesday night, in River States Conference volleyball action at Van Meter Gymnasium. The Golden Bears improved to 17-7 overall and 1-4 in conference play with a 25-15, 27-25, 25-18 sweep of the RedStorm – just the second win for Tech over Rio in 20 meetings dating back to the 2007 season. Rio Grande, which suffered a seventh consecutive loss, slipped to 3-17 overall and 0-5 inside the RSC. The highlight of the night for the RedStorm came in set two when senior Aleah Pelphrey (Piketon, OH) became the 14th member of the school’s 1,000-kill club. She finished with a match-high 14 kills in a losing cause. Rio Grande reeled off six straight points to forge a 10-10 tie in set one, but the Golden Bears responded by scoring eight of the next nine winners to take control and grab the early match lead. The RedStorm appeared headed toward a win in a back-and-forth set two after a block by freshman Macy Roell (Farmersville, OH) gave the visitors a 24-22 advantage, but Tech rallied again by scoring five of the final six points in the stanza and took a commanding 2-0 lead with a set-sealing kill by Bailey Lotozo. Rio had the lead in set three as well, 17-16, following a kill by freshman Taylor Carroll (Atlanta, GA), but the Bears clawed their way back once again and closed on a 9-1 run – including six straight winners after Carroll’s go-ahead kill – to complete the sweep. Roell and freshman Carly Shriver (Gallipolis, OH) had 13 assists each in the loss for the RedStorm, while sophomore Katie Hemsley (Jackson, OH) was credited with a team-high nine digs. Roell also had three blocks – two solos and one assist, while sophomore Kinnison Donaldson (Jackson, OH) had a solo block and two block assists. Caroline Bologna led a balanced attack at the net for Tech with seven kills, while three others finished with six. Michaela Hall added three solo blocks and two block assists in the victory. The Bears also got a match-best 28 assists from Konstantina Pateli, while Alice Amitrano and Ana Monteiro had 17 and 10 digs, respectively. Rio Grande will continue its conference road swing this weekend in Pittsburgh, Pa. against Carlow University on Friday night and Point Park University on Saturday afternoon.